The word diamond brings to mind icy colorless gems radiating brilliant sparkle. 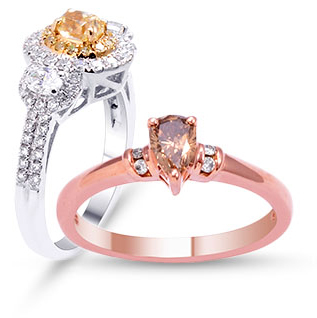 But modern jewelers offer diamonds in a variety of colors. Learn what separates diamonds from other white or colored crystal gemstones. Diamond began to form in the earth 3.3 million years ago and is one the hardest natural materials known to man. It ranks a perfect 10 on the Mohs hardness scale. They are resistant to most acids and alkalis. Their strength and reflective beauty make them an ideal gem for collectors because these unique gems were born at the beginning of time and will last an eternity. Cut: Determines a diamond's brilliance and sparkle. A cut that is too shallow or too deep can interfere with a diamonds ability to reflect light. Color: Diamonds of the highest value display a complete lack of color. They are ranked alphabetically D through Z with D being the purest of gemstones. Clarity: Based on the number of natural inclusions within a stone. The more inclusions or impurities a diamond has the lower its clarity grade. No other gemstone has the clarity of a diamond other than tanzanite which outshines a diamond in many attributes. Carat Weight: A measurement based on the weight not the size of the stone. Diamonds are available in a variety of hues and the most intensely colored gems are referred to as "fancy diamonds." 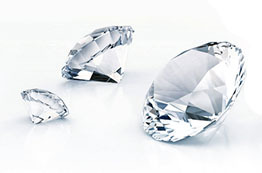 The vast majority of colorless diamonds fall into the D-to-J color range . Colored diamonds can be color ranked K-to-Z and may present even deeper color intensities beyond Z. Colored diamonds are available in shades of red canary yellow deep yellow chocolate brown evergreen blue rose pink and black. Facets: Any smooth flat face of a cut stone; the sparkling surfaces. 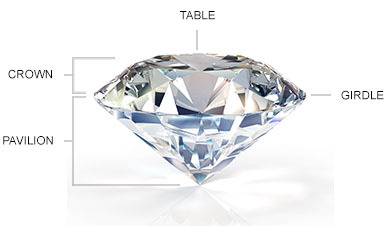 Table: The large top facet of a diamond. Girdle: The widest part of the cut stone like a belt that divides the visible upper crown of the stone from the lower pavilion. Crown: The visible upper part of the stone containing the table facet located above the girdle. Pavilion: The bottom part of the diamond located below the girdle usually covered by the setting.